Today marks the 2-year anniversary of the “official” publication of my book (review here), although the book had been available on Amazon prior to that date. 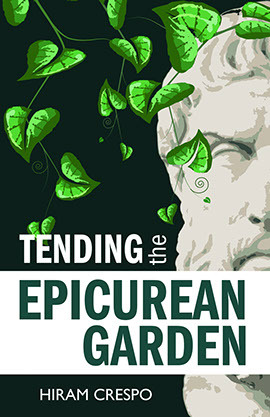 I wrote the bulk of the content on Tending the Epicurean Garden during the year 2013, but in the years since I have not ceased to learn about philosophy and about the many subjects I discussed in TtEG. For some time, I’ve wanted to give my readers a clear learning path for after they’re done reading my book, and this occasion is as good as any, so here are six important things I’ve learned about Epicurean philosophy after writing Tending the Epicurean Garden. I delved into the reading of the scrolls from the villa of Herculaneum shortly after completing my book. The scrolls are the remnants that survived the eruption of Mount Vesuvius in the year 79 of Common Era. They are a treasure trove of ancient humanist wisdom, the Humanist Nag Hammadi. In one of the scrolls, for instance, the Scholarch Polystratus anticipates the contemporary work of Sam Harris by over 22 centuries: he lays out sober and robust arguments for a hedonist moral realism based on theories of physics and ethics laid out by Epicurus in his Epistle to Herodotus. In this scroll he battled cultural and moral relativism, and superstition, and also defended the scientific study of nature as essential for ethics, decency and morality. Epicurus’ teachings against the use of empty words help us to better understand Philodemus’ Rhetorica and Methods of Inference, and in general just help us to reason more clearly. The scroll about property management provides useful guidance for our life-long self-sufficiency projects, but the most important scroll in my view, and the greatest masterpiece of humanist literature from Herculaneum has to be the one On Death, which catalogues all the logical and common-sense repercussions of our teaching that death is nothing to us. 2. Norman DeWitt is key to understanding Epicurean philosophy on its own terms. He is particularly good at explaining the Canon (epistemology) and the importance of the doctrine of pleasure as the end. Read his Philosophy for the Millions pamphlet, which narrates and gives some perspective on the historical battle between the naturalist philosophy of the scientists and the Platonic philosophy of the mystics and charlatans. 3. Frances Wright wrote the great Epicurean masterpiece in the English language A Few Days in Athens. See a detailed review here. 4. Neuroscience was a field of great interest to Epicurean philosophy from the onset. Epicurus, in his speech on Moral Development, discussed how the “atomic structure” of the brain can be changed through certain practices (like repetition of certain teachings), and how as part of our moral development, we must take ownership of the content of our brains and our characters. Later on, Lucretius discussed neural pathways in his On the Nature of Things. It is clear that, as Epicureans, we are responsible for the steady and diligent cultivation of our brains in the same way that athletes are responsible for the cultivation of their bodies. 5. Natural community (family, tribe, circle of friends) is conceived as distinct from Platonic (or imagined) communities (nations, races, ethnicities, etc.) Just as we learn in Philodemus that there is a natural measure of wealth (that corresponds with ensuring that we can satisfy our natural and necessary desires), our friends from the Las Indias Coop, while reasoning about the world from an Epicurean perspective, also argued that there is a natural (measure of) community, and even cite modern research to separate natural from Platonic communities. I use the word “measure” here to refer specifically to the Dunbar number (almost 150), which indicates how many real, significant relationships humans are cognitively able to have. Natural selection strongly favors this because our ancestors evolved in tribes, which protected individuals from weather, wild beasts, and other dangers, and also secured access to food sources and transferred traditional wisdom about where to find them. There’s other research that demonstrates that isolation is a health risk on par with obesity and smoking, so that the lone-wolf “ideal” is also unhealthy and unnatural. There’s simply no question that humans are tribal by nature. In Epicurus, the philos ideal (devoted friendship with our intellectual kin) is considered the healthiest way to build our tribe and channel our social instinct. 6. The Cyrenaics were a philosophical Atlantis, and paved the way for Epicurean ethics just as Democritus and Leucippus paved the way for physics. This entry was posted in Books, Epicurus, Humanism, Philosophy and tagged dewitt, garden, wright. Bookmark the permalink. Hi. In Michael Fontaine’s review of your book, he says this: “Only one question remains unresolved for me. It was courageous and commendable for Crespo to insist that proper diet, exercise, and moderation of our appetites are key to our happiness. He recognizes, as Epicurus did, that at the end of the day we alone decide what to ingest or inhale; those choices are our own. In candidly pinpointing self-control as a means of achieving happiness, Crespo puts himself squarely at odds with the dominant ethos of the medicalized society in which we now live. He doesn’t say whether kicking anti-depressants in favor of other approaches to finding happiness will help—whether the “pharmacratic” criticisms raised by Szasz, Schaler, Leifer, and others can be synthesized and integrated into his updated framework. That, I think, is the obvious next step for him and his companions as they embark on their mission to promote Epicureanism today.” Was this line of inquiry ever pursued? I would appreciate any links. Specifically re the idea as to what might this interpretation of Epicureanism have to say about, say, the alleged inability to the “addict” (to some material substance or mode of behavior) to exercise self-control? Hi – thanks for visiting my blog. We’ve discussed among the Friends of Epicurus and decided that it’s not a good idea to openly criticize modern psychiatry as a whole. Also, keep in mind that we are not licensed or trained in pharmacology, so it’s probably also irresponsible to speak on the issue as if we had authority. We have had people suffering from depression in the Epicurean philosophy group, and it’s very clear that we are not equipped to help them, that some of these patients require professional help. Also, as for integrating Szasz, some Friends of Epicurus are against it, and as for myself in particular–I’m not too familiar with his work and am currently focused on reading about unrelated subjects. I will say that the science of happiness conversation delves into issues of addiction when it advises us to consider “hedonic adaptation”, which is a modern version of how ancient Epicureans advised to study and understand the natural limits of our desires in our choices and avoidances. Epicureans used cognitive therapy to treat issues related to the limits of our desires. I am not familiar with the SMART program, which is a secular alternative to Alcoholics Anonymous, but I wonder if they incorporate Epicurean therapeutic theories into their methods. And as for the realm of neuroplasticity and its contributions to addiction recovery, the Buddhists have been the most active group in providing case studies for how contemplative and other practices help to shape and optimize the brain. Ancient Epicureans knew of neuroplasticity, but modern Epicureans have not made contributions to this field, and I’m probably the only Epicurean who has expressed an interest in future neuroplasticity research. that said, i look forward to reading your book! I hope you enjoy my book and find it useful. Here is a link re: the SMART Program, a secular alternative to AA. Hope it helps. I may check them out on Wed April 5, when there is a local meeting. Thanks! They are actually having their annual Epicurean symposium in February 10-11, 2018, Cultural Center of Pallini, Athens. It’s free entrance. The modern nome (neighborhood within Athens) of Pallini is where Epicurus had his garden. This nome was known as Gargetos in antiquity, if I’m not mistaken. The mayor of Pallini is typically involved every year in the symposia. He’s very knowledgeable about Pallini, and is also building a modern monument with the 40 Principal Doctrines and an effigy of Epicurus. He may be the ideal person to speak to, or anyone of the organizers of the symposium or people from the website linked above. Thank you for your reply! I have already contacted the Epicurean Gardens, but no response. And the sources I know of say it’s along the ancient road from the Dipylon gate to the Academy. Apparently he originated from Pallini. The Garden was somewhere else. I’ll keep searching for answers.